« Day 46 – Cyndi P.
Some friends of mine were in town this weekend and we met for brunch at Kramer’s in Dupont. For those of you who have been following the blog, you probably have figured out that I like that place. They have a decent brunch. I am not sure that I am a brunch person…I always struggle between the breakfast and lunch options. It doesn’t really matter I guess though, whatever you order you are going to eat too much probably and feel a bit comatose when you’re done. As we forced our sluggish bodies out of the iconic locale, we saw a homeless man right outside of the door. I decided to see if he would accept my $10. It’s a strange feeling when you stand inches away from someone who has committed heinous crimes and feel compassion for them rather than fear. To say that Norman is a likeable fellow is an understatement. Norman said he was going to use the money for some food and transportation this week. He said it was very generous. On a good day he told me he can bring in about $110 panhandling. One time a doctor over near P Street gave him $40. 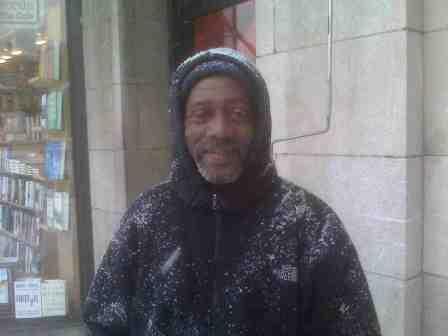 Like many of the other homeless people that I have met, I feel sad to say goodbye. I know that I am going back to my warm comfortable home and he will still be here in 20 degree weather. I shake Norman’s hand and give him a smile and tell him to take care of himself. I hope that I run into Norman again. By the way, I have updated the statistics page this weekend and continue to add to the Lend A Hand section. on February 6, 2010 at 12:23 pm | Reply Deb! You are so blessed to meet all of these people.. I would love to be with you as you do this and learn about everyone~ This idea you have is fabulous.. Looking forward to more stories!